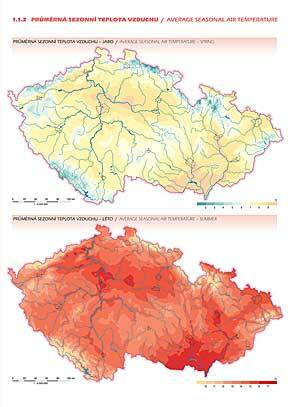 The Climate Atlas of Czechia is a thematic cartographic book with encyclopedic elements that provides a complex view of the climate in the territory of Czechia. The publication contains more than 300 maps accompanied by graphs, photographs, and explanatory text both in Czech and English. Readers will find answers for many climate questions, such as, Where is the place with the longest sunshine duration in Czechia? How many tropical days can be expected in some Czech towns? How often does precipitation fall? The atlas was principally authored by Tat�na M�kov�, Martin Str�, Radim Tolasz, Anna Valeri�nov�, and V�t Vo�en�lek and published by the Czech Hydrometeorological Institute (CHMI) in Prague and Palacky University in Olomouc in March 2007. More than 70 authors contributed. The objective of the authors was to create a climate atlas that would cover the years 19611990, deemed by the World Meteorological Organization to constitute a standard climatologic period. To achieve maximum accuracy and after due consideration, the period was extended to 40 years (i.e., 19612000). The content of the atlas was composed with regard to the growing requirements of contemporary readersboth experts and nonspecialists. Based on a comprehensive analysis of future users' needs, the authors decided to divide the atlas into 11 sections. The climatologic characteristics derived from basic meteorological elementsair temperature, atmospheric precipitation, snow, atmospheric humidity, sunshine, solar radiation, atmospheric pressure, wind direction and speed, soil temperature, and atmospheric phenomenaare displayed, as well as special analyses, such as the drought severity index and the characteristics of air evaporation and pressure. The "Dynamic Climatology" chapter contains details of characteristic weather conditions. 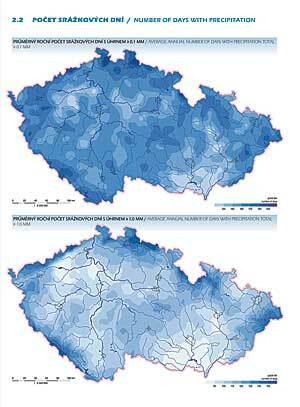 The long-term overview is supplemented by special weather cases, such as flood situations occurring in the last 10 years in Czechia. The form in which the atlas is arranged aligns the book with the most modern climatologic publications. In addition, its content represents an important basis for research of climate evolution in the last 40 years. It is one of the first elements of a mosaic that will provide climatologists with information about the climate change process and its effects on the earth. Spatial analysis of the individual climatologic elements proceeded from point observations by measuring stations. When creating the maps, parts of the climatologic database application CLIDATA, an extension of the ArcView software tool, were used. When creating the maps, a horizontal resolution of 500 meters was always used. To obtain maps displayed using a scale of 1:1,000,000, the original grid layer was resampled, applying polygon approximation to achieve a spatial resolution of 100 meters. For more information, contact Radim Tolasz, deputy director of CHMI (e-mail: tolasz@chmi.cz); Anna Valeri�nov�, CHMI (e-mail: anna.valerianova@chmi.cz); Tat�na M�kov�, CHMI (e-mail: mikova@chmi.cz); Martin Str�, CHMI (e-mail: striz@chmi.cz); or V�t Vo�en�lek, Palacky University (e-mail: vit.vozenilek@upol.cz). 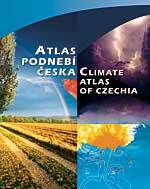 The atlas is distributed by the Czech Hydrometeorological Institute only. It can be ordered through www.atlaspodnebi.cz/en/menu.html (English version of the Web site), or orders can be sent directly to Czech Hydrometeorological Institute, Climatology Section, Na Sabatce 17, 143 06, Praha, Czech Republic (fax: 420-244-032-276, e-mail: atlas.podnebi@chmi.cz). Please see "GIS Instrumental in Creating First Vegetation Atlas for Madagascar" for information about another atlas that may be of interest to you featured in this issue.